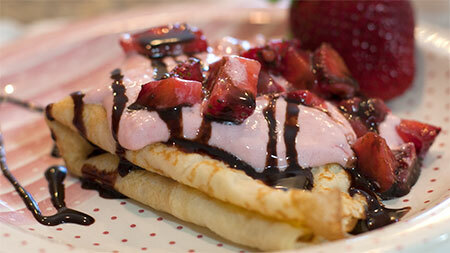 Ooola-la crepes was demonstrated for the March 2013 HomeCook'n Newsletter. Put 1 3/4 cups of the milk, the eggs, and salt into a blender. Whiz for a few seconds to blend everything together. Remove the lid and add the flour. Cover and blend until very smooth, about 20 seconds. Remove the lid, pour in the melted butter, cover, and whiz until combined, 10 seconds more. Transfer the batter to a large glass bowl. Let the batter rest for at least 5 minutes and up to 24 hours. (If resting for more than 30 minutes, store in the fridge.) When you're ready to make the crepes, test the batter's consistency; it should be as thick as heavy cream but not as thick as pancake batter. If it feels too thick, whisk in up to 1/2 cup of the remaining milk. Heat an 8-in crepe pan or nonstick skillet over medium high heat until it's hot enough to make a drop of water sizzle upon contact. Using a folded paper towel, spread about 1/2 tsp butter around the interior of the pan. The butter should sizzle upon contact but not instantly turn brown. You don't want the pan to be so hot that the butter burns.